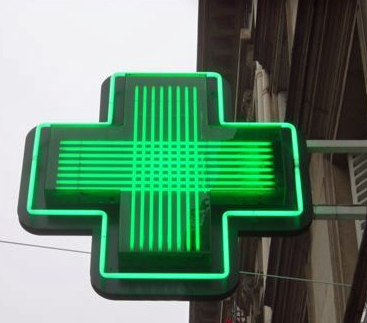 Look for the green cross - preferably on the Champs Élysées where people are mostly bilingual. ......try going into a French pharmacy for meds when your French is limited (I dare you). Me: Never mind, I'll just look around myself. Merci. Now I know the words are almost the same in both languages, but I couldn't pronounce the French and obviously I wasn't getting through. Me: Pas ça! And I emphasized this by shaking my head. The woman furrowed her brow and thought. No, she didn't get it. I think she just wanted me to leave. But then I had a stroke of luck. A customer arrived at the counter and he was good at guessing games. After a few minutes a broad smile crossed his face and Eureka - he got it! (Sorry, no prize Monsieur). We all laughed as I paid up but inside, I swore this would never happen again. So now I pack the equivalent of a small drugstore minus the cash register for travelling. Which just goes to show.....even if you know the words, it doesn't mean you'll get your message across! That's my tip of the week!